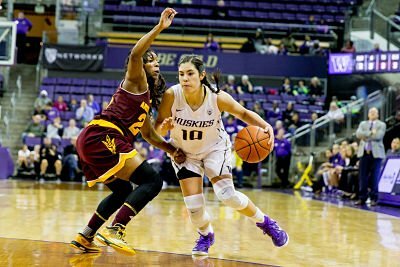 Kelsey Plum drives past ASU’s Elisha Davis. Photo by Scott Eklund/Red Box Pictures. 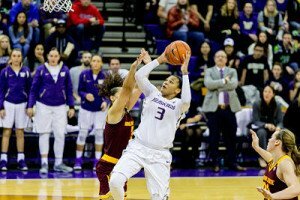 The University of Washington Huskies found themselves in an unexpected spot earlier this week when the AP Top 25 Women’s Basketball Poll was released: they were back in it, for the first time since 2003. But while No. 25 Washington’s return was celebrated by fans, it is not necessarily a big deal for the players that earned it. Thus far, that focus has paid off. Despite a loss to No. 16 Stanford on Friday night, the Huskies are 15-5, and 6-3 in the Pac-12. That defeat snapped a four-game winning streak, and was their first loss since losing sophomore guard Brianna Ruiz. 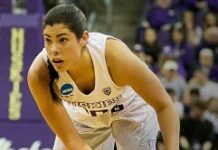 Ruiz, who went down early in the team’s 63-47 win over Arizona on Jan. 10 with what would prove to be a season-ending knee injury, had started 15 of the UW’s 16 games to that point, and was averaging 30 minutes, six points, and three rebounds a night. “She was doing so well, and she was a big piece to our puzzle, and so it was really hard to lose her,” senior forward Talia Walton said. In her absence, senior guard Alexus Atchley (a former walk-on at Colorado) has stepped into the starting lineup to impressive results, including a career-high 15 points against Washington State. In the close victories against No. 15 UCLA, then-No. 25 USC, and WSU that followed Ruiz’s injury (all at home, and all by less than 10 points), the Huskies have relied heavily on their starters to carry the workload. Out of a total of 200 minutes on the floor, the starters have combined to cover 181 against the Bruins, 178 against the Trojans, and 185 against the Cougars. In the loss to Stanford, they combined for 176. And with Atchley now in the starting lineup, head coach Mike Neighbors said someone else now has to step into the role she had played prior to the injury. In the meantime, the Huskies will rely heavily on Plum — the conference’s leading scorer, averaging more than 27 points per night — and Walton — also in the top-10 with almost 17 a game and one of the top 3-point shooters in the Pac-12 — to provide the lion’s share of the team’s scoring. Junior forward Chantel Osahor also appears in the conference’s top-25, as the team third double-digit scorer, averaging 10 points per game. Junior forward and former McDonald’s All-American Katie Collier is averaging career-highs in points, rebounds, and minutes, starting all 19 games thus far after combining to start just five in her first two seasons at Washington. Talia Walton makes a tough shot. Photo by Scott Eklund/Red Box Pictures. With Ruiz out of the lineup, Neighbors said some parts of the game plan change. Senior forward Mathilde Gilling has been the first player off the bench, playing about 15 minutes a night, but it remains to be seen who else joins the rotation. Strother, a McDonald’s All-American last year, has shown flashes of the potential that made her one of the top prospects in the nation, including an 11-point, seven-rebound performance in 11 minutes against Portland on Dec. 2, while Kingma has a bit more experience, with 21 appearances and two starts as freshman last season. On Friday night, both Atchley and Plum played the full 40 minutes, while Kingma played 15, Gilling six, and Strother three off the bench to spell Collier and Osahor. The team will likely be counting from minutes from at least one of Kingma and Strother in the coming weeks to avoid relying on a six-player rotation for the next two months. To remain in the top-25, it’s probably necessary. For Walton, that ranking does carry some meaning, calling it “a big deal” and saying it has instilled a lot more confidence in each player. However, she said the team’s work is far from done.